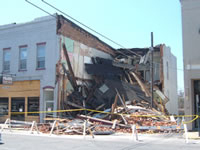 For forensic engineering, Norton & Schmidt performs site visits, observations and testing regarding conditions, damages and/or failures of various buildings, structures and equipment. 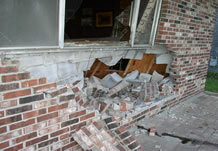 We are experienced in modifications and repairs to existing structures. Our qualified staff completes reports regarding cause and origin investigations, as well as, provides expert witness testimony. Norton & Schmidt has completed over 14,000 projects for overall condition and various problems such as: improper construction or installation, collapse, blasting, vibration, fire, lightning, tornado damage, hail, wind, vehicular impact, expansive soil conditions, settlement, framing failure, retaining-structure failure, condensation/moisture deterioration, mold/fungus, building envelope issues, wind and water leakage, facades, exterior insulation and finish systems (EIFS) and age.